The church of the Dormition of the Virgin in the area of Palaia Episkopi in Tegea of Arcadia is dated to the second half of the 10th century. The central dome collapsed during the decade of 1850s resulting to its gradual damage. In 1884 the Tegean Association (Tegeatikos Syndesmos) undertook the restoration of the Byzantine church and invited Ziller to execute the designs of the reconstruction works. The project was completed in 1888 and the church officially opened in 1889. Between 1936 and 1939 the well-known artist Aginoras Asteriades completed the internal decoration of the church with a series of wall-paintings. The following years a numerous problems related to its construction put the building and its murals at risk. 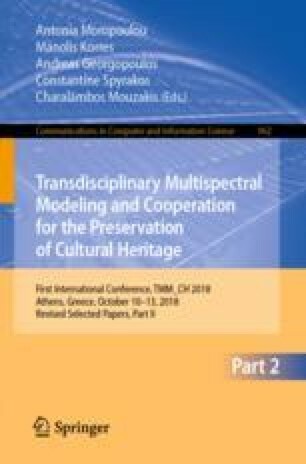 The study “Restoration and Consolidation of the Byzantine Church of Palaia Episkopi in Tegea, Arcadia” was presented originally as a thesis at the MSc “Protection of Monuments”, Track A, National Technical University of Athens (NTUA) with Supervisor Pr. Spyridon Raftopoulos. Then it was approved by Central Archaeological Committee (KAS) of Hellenic Ministry of Culture in 2006 and was implemented by the Directorate of Anastylosis of Byzantine and Postbyzantine Monuments (DAVMM) and the 26th Ephorate of Byzantine Antiquities during 2007–2009. It aimed to eliminate the causes of damage and tried to ensure the continuous protection of the building as well as the promotion of the historical, archaeological and aesthetic qualities of the monument. K. Siountri—Postgraduate Programme (M.Sc.) “Digital Culture, Smart Cities, IoT and Advanced Digital Technologies”, Track “Digital Culture”.